The new dates come after the university was re-opened by president Museveni, with classes set to resume on 2nd January 2017. Makerere university management has set 21- 24th February 2017 for the 67th graduation ceremony. The university Vice Chancellor, Prof John Dumba Ssentamu, says the teaching staff must submit the students’ examination results by 16th January 2017. 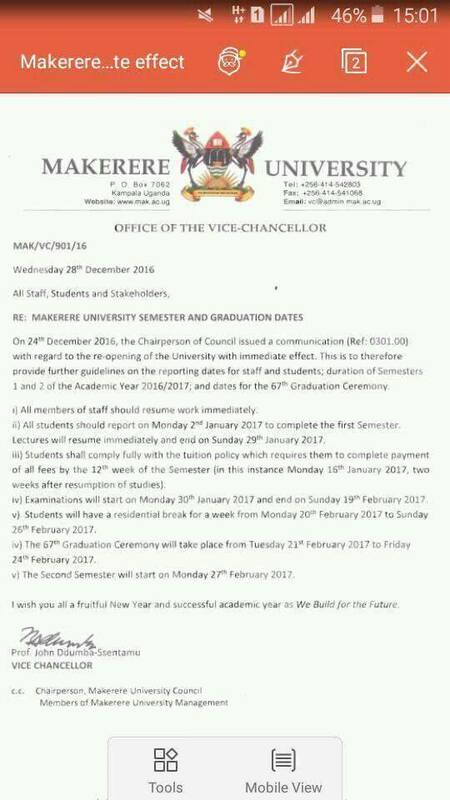 The new dates come after the university was re-opened by president Museveni, with classes set to resume on 2nd January 2017.